Globethics.net welcomes St. Paul's University and Daystar University as institutional members of the Globethics.net Consortium on Ethics in Higher Education. 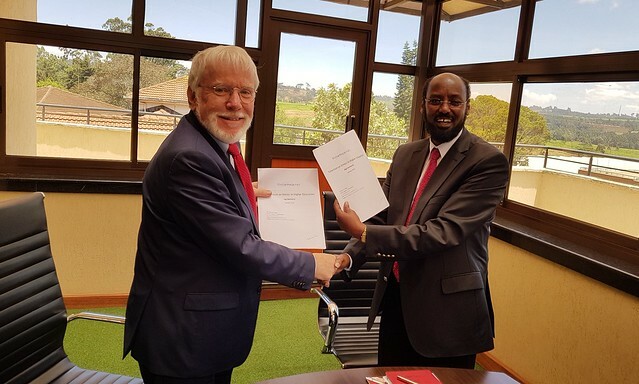 During a three-day tour of Kenya, Dr Christoph Stückelberger represented Globethics.net at a number of events to promote the newly established Consortium on Ethics in Higher Education. Included in the trip's itinerary was St. Paul's University (SPU) and Daystar University. During his time at SPU, Dr Stückelberger, a former alumnus, met with the university Vice-Chancellor, Joseph Galgalo, who was impressed by the consortium project. SPU is an established university in the African continent and boasts four campuses with an enrolment of over 7,000 students. Daystar University is a Christian liberal arts university in Nairobi and prides itself in training broad-minded critically thinking graduates. It has over 5,000 students in 32 undergraduate majors, 16 master programs, and 2 Ph.D. programs. Globethics.net is excited to welcome SPU and Daystar, universities with excellent track records, and looks forward future collaborations that will benefit all Consortium members.